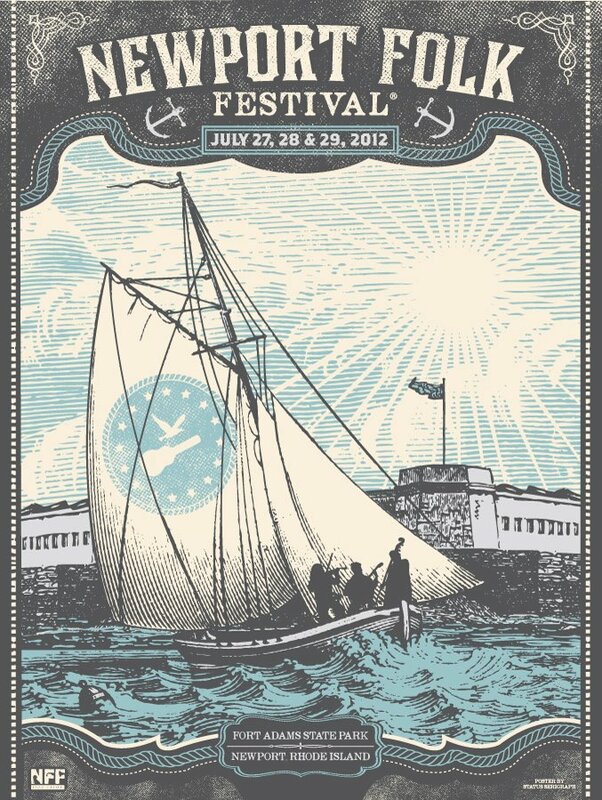 Newport Folk Festival 2012 was highly anticipated, and did not disappoint. Newport Folk Festival 2012 featured some wonderful performances from well known, as well as somewhat lesser known artists. The impressive headlining performances included a festival-opening set by Wilco on Friday night, and a festival-closing set from Jackson Browne on Sunday. In between the two there were a number of stellar performances which were spread among the festival’s four stages. For me however, it all boiled down to two sets, one on Saturday and one on Sunday, that took place on the festival’s smallest stage. The Museum Stage got its name from its location inside the Museum of Yachting, which is on the grounds of Fort Adams, where the festival is held each year. It is the only indoor venue at the festival, and people lined up to see performers there throughout the weekend. 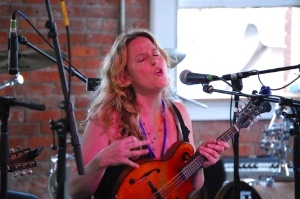 The first special set was provided by Amy Helm on Saturday afternoon. Levon Helm was on everyone’s mind this year, and in case anyone forgot, his visage could be seen from time to time on the big screen that stood next to the festival’s main stage. Levon had provided the festival with some of its most joyous moments in recent years, so having his daughter there to perform was very special, and spoke to the respect for tradition that is the hallmark of this very special annual event. Amy was joined for the occasion by a bass player and two acoustic guitar players as she held down the mandolin spot. There were exquisite cover versions of the Rolling Stones’ “Moonlight Mile,” and an especially wistful take on the Band’s “Twilight,” which Amy dedicated to the legendary group The real show stopper however was a song called “Roll Away.” I can’t claim to know what the song was written about, but the lyrics clearly seemed to touch on a recent loss, and there was not a dry eye in the house as Amy brought a gentle nobility and an wistful longing to the powerful material. At first it felt a little odd to have tears streaming down my face, but when I looked around, everyone was wiping their eyes. The love for Levon, and by extension Amy, was palpable. It will remain one of my favorite Newport moments in all of my years of going to the festival. 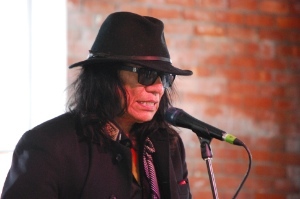 On the Saturday morning of the festival I had the chance to interview Rodriguez. You have probably heard his story by now. 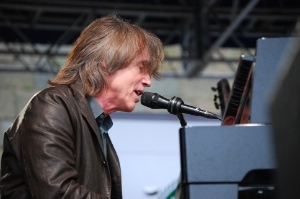 He’s a singer songwriter from Detroit who made two excellent albums in the early ’70s. Unfortunately, neither one made a dent, and Rodriguez gave up the music business and started working regular jobs. That might have been the end of the story, but it was far from over. Somehow, those albums made their way to Australia where they became popular, and bootleg versions reached South Africa where the music became a touchstone during the battle against apartheid. Rodgriguez never knew about any of this though, and everyone thought he was dead anyway. In the late ’90s, a detective decided to find out how Rodriguez died because there were all sorts of rumors regarding his death. The thing is, he wasn’t dead at all, and the detective found him right where he’d always been in Detroit. A tour of South Africa was arranged and Rodgriguez played to sold out venues. He was treated as a hero there. More recently, his albums have been reissued, and a documentary about him called Searching For Sugar Man has been winning rave reviews. On Sunday, Rodgriguez was scheduled to play a set on the Museum Stage. He’s around 70 years-old now, somewhat frail, and his eyesight doesn’t seem to be what it once was, but there is no question that the aura of a star surrounds him. He doesn’t perform live much these days, and he was clearly nervous when he took the stage. At first I wondered if what we were about to see would be uncomfortable, a train wreck. Frankly, it had all the makings. A nervous performer, an anxious but interested audience, and a water bottle that kept getting knocked over. But then Rodgriguez began to sing in a soft voice, accompanying himself on acoustic guitar, and the magic began. Song by song the Newport audience lifted the songwriter on its shoulders, and song by song his confidence grew. Four or five songs in he was displaying confidence, and a little later he was telling jokes between songs. The crowd adored him, calling for that rarest of things, an encore at the Newport Folk Festival. It was a stunning experience for both the audience and the performer, which he acknowledged with a series of deep, heartfelt bows from the waist. Two artists. Two days. Two small stages. Two performances that will become legendary in the storied history of the Newport Folk Festival. I would be remiss if I failed to mention one more artist who just blew my head off. 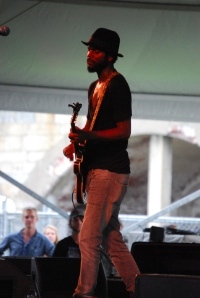 Gary Clark Jr. is a brilliant blues-rock guitarist and singer who captured the crowd at the Quad Stage with a simply overwhelming display of instrumental and vocal prowess. Looking at my notes taken during his set, I see the words Hendrix, Prince, ZZ Top, and the Stylistics. It’s all there, but Gary Clark Jr. makes it all his own. I can say with some confidence that he is an artist that you will be hearing a lot about in the very near future. Finally, I want to talk a little about the logistics of this year’s festival. Let me preface my comments by saying that I have undying respect for the people who coordinate this great festival, and whatever they’ve been doing is clearly working really well as the festival has returned to a prominence that was missing for many years. Although I attend the festival as a journalist these days, I will always be a fan first. As a fan, the festival felt overcrowded this year. Just because you can do something, i.e. sell more tickets, doesn’t always mean that you should. As I said, I have great respect for the people who put this thing together. I know they’ll fix it. With those reservations in mind, I am happy to report that in terms of the music, the festival was a triumph. All due credit should be given to producer Jay Sweet for crafting a scintillating lineup that had something for everyone. There was a lot of new music to discover, combined with more familiar sounds with which to get reacquainted. Meanwhile, Sweet’s efforts to skew the festival to a younger demographic are clearly paying off. For the festival to survive, it must appeal to the next generation of music fans, while retaining its traditional fan base. It’s a tough balance to master, but a casual glance around Fort Adams, the historic home of the festival, made it clear that the strategy is working. 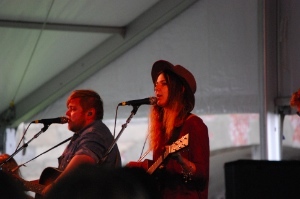 Bringing in buzzed-about young acts like Of Monsters and Men, and Trampled By Turtles is having an impact. Sweet has also made sure that the festival’s home state is well represented on stage, a fact not lost on festival goers from the Ocean State. 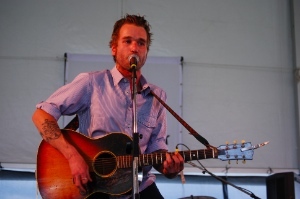 This year’s lineup included return visits from Deer Tick, and Brown Bird, and a stunning first-time appearance by Joe Fletcher & the Wrong Reasons. The latter two artists hail from a small East Bay town called Warren, while Deer Tick is from Providence and celebrated their home standing status by hosting after parties at a Newport club when the festival ended each night. 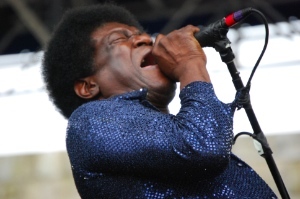 Elsewhere, soul legend Charles Bradley brought the thunder with a funky set that ended with him leaving the stage and hugging everyone up front, overcome with emotion as a result of the reception that he received. 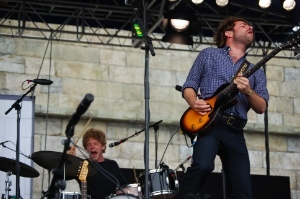 Dawes graduated to the main stage this year, and proved that they belong there. They’re a band that continues to get better each time I see them. 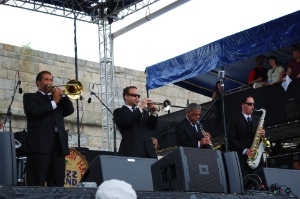 And the Preservation Hall Jazz Band brought the class and thrilling musicianship that they are well known for. For me, the Newport Folk Festival remains the best music experience that you can possibly have. Long may it run.